About Kawada Auto Co., Ltd. Please fill out this form of down below and send it back to us. We'll offer you the best services accordingly. The customer's request and the situation of the car are confirmed, and it's repaired after I arrange with a customer, so please feel free to consult any time. A rental car during an automobile inspection is also prepared. It's taken back and car delivery service are performed. 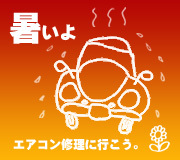 Before going out by travel and long distance, we can check the state of the car and go out surely. Such as a brake, cooling water, an engine and a tire, It stops, I run, it bends, such as, the performance of the car is checked basically. A visitor exchanges the engine oil according to that request forcusing on WAKO's, RESPO and Speed Master of our recommendation. We'll keep the summer tire and the winter tire which would be a problem at the put place instead. When you reserve a tire change during a period in 1, the contract term is free. A car navigation equipment is rented in order not to waver in the place where you go the place first. You are relieved with this! The map is also unnecessary. Installation and setting are performed. It's wasteful to buy a car. But the rental car is expensive. If it's lease, risk is high. I recommend a cheap used car rental car for such time. 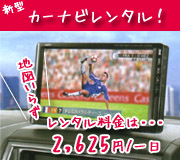 It's from more than one month and it can be rented from 39,900 yen (including tax). The engine doesn't start! A clutch is slippery! Oil leak! Water leaking! Overheat! An engine doesn't move! A car isn't developed at the front! It was flooded with water by flood damage! You played a trick at aim in the car! Glass has broken! Window doesn't rise! A key was lost! Effectiveness of a brake is bad! Effectiveness of an air conditioner is bad! An allophone does from braking with the motor! Navigator audio doesn't operate! A tire went flat! A car is bumped, and it doesn't move! If a part was removed, you didn't find out any more that you corrected it! If you are in trouble about a car, we will run immediately. We'll ask you about customer's request (the budget, the car type, equipment, the color and the number of distance) and look for the most suitable car from a car dealer in the whole country and in the auction.